Home > News > Bookmans Welcomes a New Community Outreach Coordinator! Bookmans has been working with the local communities our stores serve for more than 40 years. From school and charity donations to festivals to animal rescue events, Bookmans has been proud to work hand-in-hand with community leaders and representatives to make our cities outstanding. Of course, we couldn’t do that without talented individuals who make the community connections that matter. In the booming Tucson community, we needed someone with the know-how and infectious smile to make those important connections, and that’s what our new Community Outreach Coordinator Stephanie Engs brings to the table. We already know that she’s an expert at building bridges and working with the Tucson community, but Bookmans loves to find and share what people geek out about too. 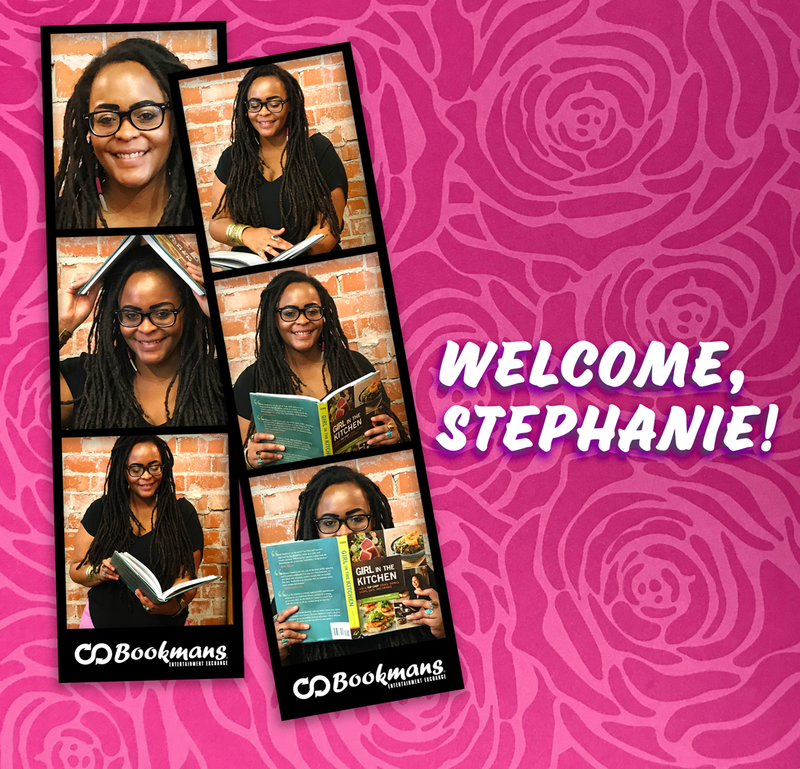 Let’s get to know a bit more about Stephanie with some Q&A, Bookmans-style! Bookmans: How long have you been shopping at Bookmans? Stephanie: I am a Tucson native, so I’ve been a Bookmans shopper for as long as I can remember. My mom would bring me to Bookmans when I was a wee tot, and we read together in the children’s section. Bookmans: What part of your job is most exciting? Stephanie: This job is all very new, but so far the interactions I’ve had with both employees and customers have been fantastic. Each employee and customer has their own wealth of knowledge and interests. I have so much to learn! Bookmans: What do you geek-out hardest about? Stephanie: I love to explore music. I am a DJ for KXCI Community Radio during my free time. Sometimes I’ll give myself playlist challenges like everyone on this playlist must be a POC or LGBTQ or from a Latin American country, random, stuff like that. Bookmans: Which book from your childhood inspired you to keep reading? Stephanie: I loved books with female characters that didn’t have the tools for the obstacles they encountered but were resourceful. Girls like Meg Murry from A Wrinkle in Time or Lyra Silvertongue from His Dark Materials or the girl in Island of the Blue Dolphins. Those are the girls that kept me reading. Bookmans: What are you reading now or are excited to read next? Stephanie: Right now, I’m really into Afrofuturism. I just finished reading An Unkindness of Ghosts by Rivers Solomon, and I am excited to read Children of Blood and Bone by Tomi Adeyemi. I’ve always had a thirst for the sort of imagery, characters, and storytelling in these books and what I see in comics and films like Black Panther or even musical artists like Janelle Monae and Solange. I’m happy that these ideas are being explored in interesting ways and becoming part of the mainstream. Bookmans: If you were an expert in anything pop culture-related, what would it be? Stephanie: That’s a tough one. There is a special place in my heart for film. I’m a proud Loft member. I love to get swept away and feel things in the moment of watching a movie. The most visited app on my phone is IMDB. I use it like 20 times a day! Bookmans: What’s your secret superpower? Stephanie: Some of my friends call me desert bruja. I love to host and cook for my friends and family. I bring them concoctions I make when they are sick or sad. If you are a local business in Tucson and you want to reach out to Bookmans for a partnership, community event, or sponsorship, make Stephanie your first point of contact!